Last night I spoke with Luca Cipriani from Arduino to learn more about the new AWS-powered Arduino Web Editor and Arduino Cloud Platform offerings. Luca was en-route to the Bay Area Maker Faire and we had just a few minutes to speak, but that was enough time for me to learn a bit about what they have built. If you have ever used an Arduino, you know that there are several steps involved. First you need to connect the board to your PC’s serial port using a special cable (you can also use Wi-Fi if you have the appropriate add-on “shield”), ensure that the port is properly configured, and establish basic communication. Then you need to install, configure, and launch your development environment, make sure that it can talk to your Arduino, tell it which make and model of Arduino that you are using, and select the libraries that you want to call from your code. With all of that taken care of, you are ready to write code, compile it, and then download it to the board for debugging and testing. 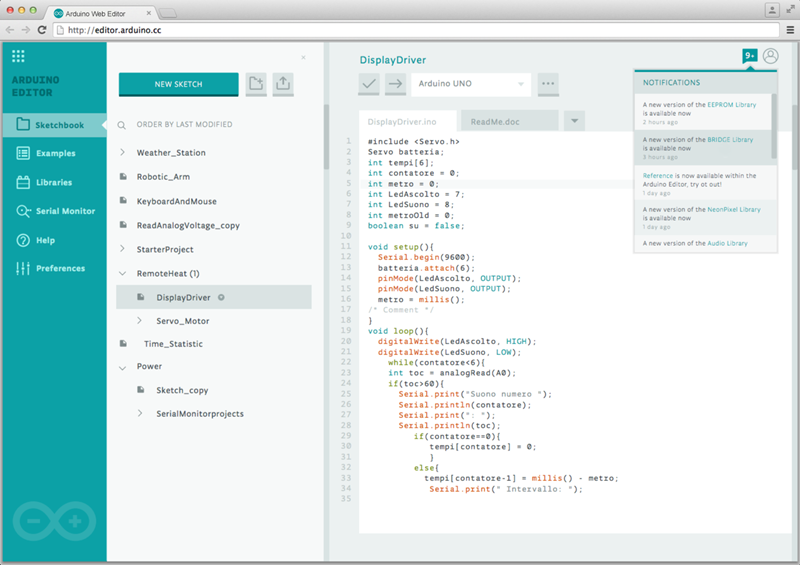 Luca told me that the Arduino Code Editor was designed to simplify and streamline the setup and development process. The editor runs within your browser and is hosted on AWS (although we did not have time to get in to the details, I understand that they made good use of AWS Lambda and several other AWS services). You can write and modify your code, save it to the cloud and optionally share it with your colleagues and/or friends. The editor can also detect your board (using a small native plugin) and configure itself accordingly; it even makes sure that you can only write code using libraries that are compatible with your board. All of your code is compiled in the cloud and then downloaded to your board for execution. Because Arduinos are small, easy to program, and consume very little power, they work well in IoT (Internet of Things) applications. Even better, it is easy to connect them to all sorts of sensors, displays, and actuators so that they can collect data and effect changes. The new Arduino Cloud Platform is designed to simplify the task of building IoT applications that make use of Arduino technology. Connected devices will be able to be able to connect to the Internet, upload information derived from sensors, and effect changes upon command from the cloud. Building upon the functionality provided by AWS IoT, this new platform will allow devices to communicate with the Internet and with each other. While the final details are still under wraps, I believe that this will pave the wave for sensors to activate Lambda functions and for Lambda functions to take control of displays and actuators. I look forward to learning more about this platform as the details become available! Today’s guest post comes from K Young, Director of Strategic Initiatives at Datadog! AWS recently announced enhanced monitoring for Amazon RDS instances running MySQL, MariaDB, and Aurora. Enhanced monitoring includes over 50 new CPU, memory, file system, and disk I/O metrics which can be collected on a per-instance basis as frequently as once per second. AWS worked closely with Datadog to help customers send this new high-resolution data to Datadog for monitoring. 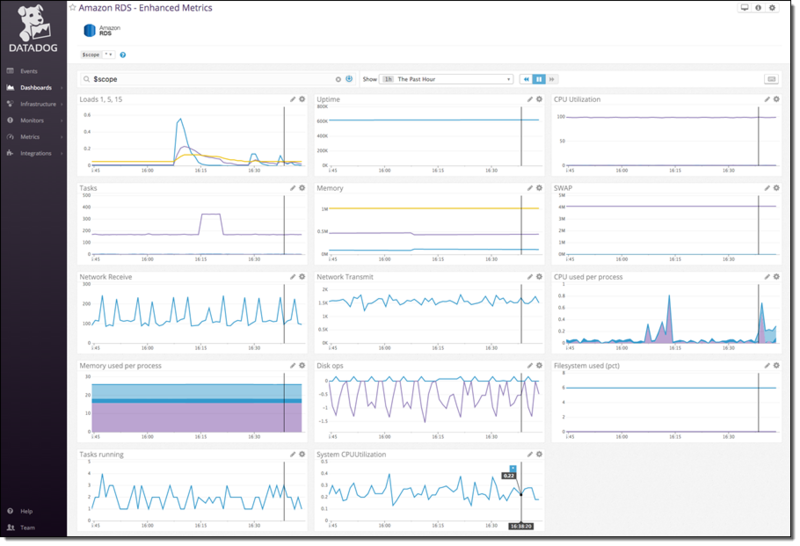 Datadog is an infrastructure monitoring platform that is very popular with AWS customers—you can see historical trends with full granularity and also visualize and alert on live data from any part of your stack. Set Granularity to 1–60 seconds; every 15 seconds is often a good choice. Once enabled, enhanced metrics will be sent to CloudWatch Logs. Create a role for your Lambda function. 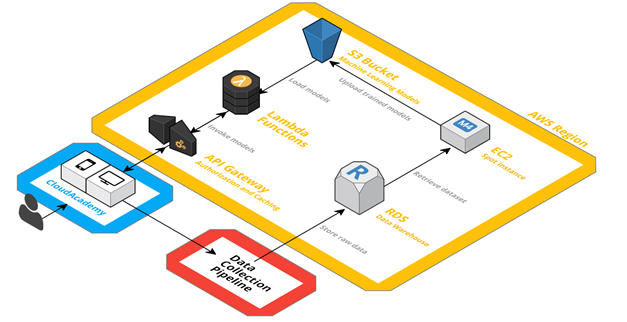 Name it something like lambda-datadog-enhanced-rds-collector and select AWS Lambda as the role type. From the Encryption Keys tab on the IAM Management Console, create a new encryption key. Enter an Alias for the key like lambda-datadog-key. On the next page, add the appropriate administrators for the key. Next you’ll be prompted to add users to the key. Add at least two: yourself (so that you can encrypt the Datadog API key from the AWS CLI in the next step), and the role created above, e.g. 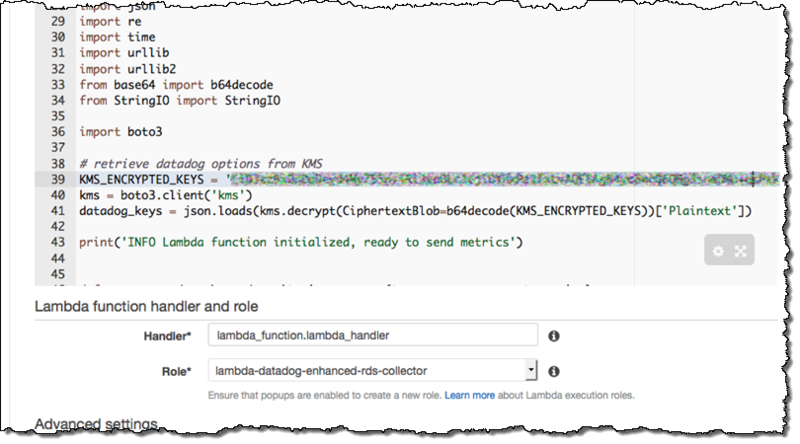 lambda-datadog-enhanced-rds-collector (so that it can decrypt the API key and submit metrics to Datadog). Finish creating the key. Save the output of this command; you will need it for the next step. 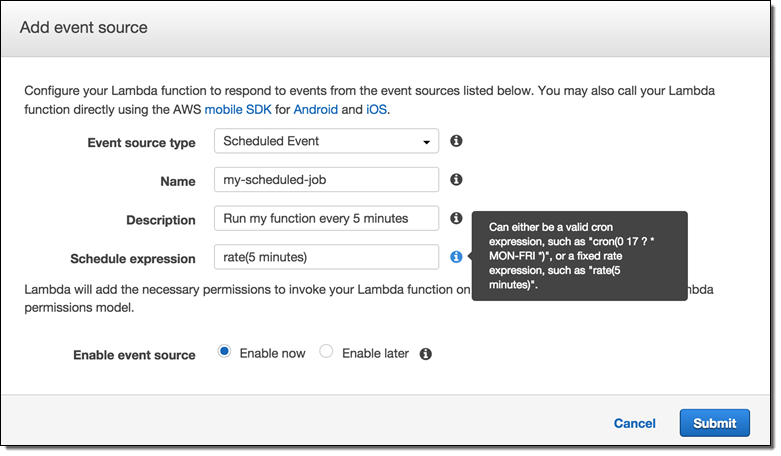 From the Lambda Management Console, create a new Lambda Function. Filter blueprints by datadog, and select the datadog-process-rds-metrics blueprint. Give your function a name like send-enhanced-rds-to-datadog. In the Lambda function code area, replace the string after KMS_ENCRYPTED_KEYS with the ciphertext blob part of the CLI command output above. Under Lambda function handler and role, choose the role you created in step 2, e.g. 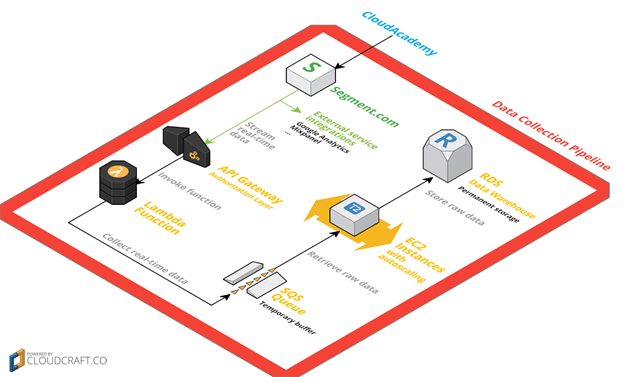 lambda-datadog-enhanced-rds-collector. Go to the next page, select the Enable Now radio button, and create your function. Once you have enabled RDS in Datadog’s AWS integration tile, Datadog will immediately begin displaying your enhanced RDS metrics. Your RDS instances will be individually identifiable in Datadog via automatically-created tags of the form dbinstanceidentifier:YOUR_DB_INSTANCE_NAME, as well as any tags you added through the RDS console. You can clone the pre-built dashboard and customize it however you want: add RDS metrics that are not displayed by default, or start correlating RDS metrics with the performance of the rest of your stack. AWS CodeCommit is a fully-managed source control service that makes it easy for you to host a secure and highly scalable private Git repository.Today we are making CodeCommit even more useful by adding support for repository triggers. You can use these triggers to integrate your existing unit tests and deployment tools into your source code management workflow. Because triggers are efficient and scalable, they are more broadly applicable than a model that is built around polling for changes. I believe that you will find these triggers to be helpful as you move toward a development methodology based on Continuous Integration and Continuous Delivery. You can create up to 10 triggers for each of your CodeCommit repositories. The triggers are activated in response to actions on the repository including code pushes, branch/tag creation, and branch/tag deletion. 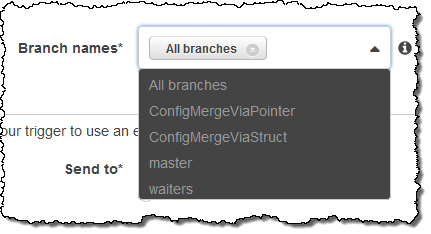 Triggers can be set to run for a specific branch of a repository or for all branches. 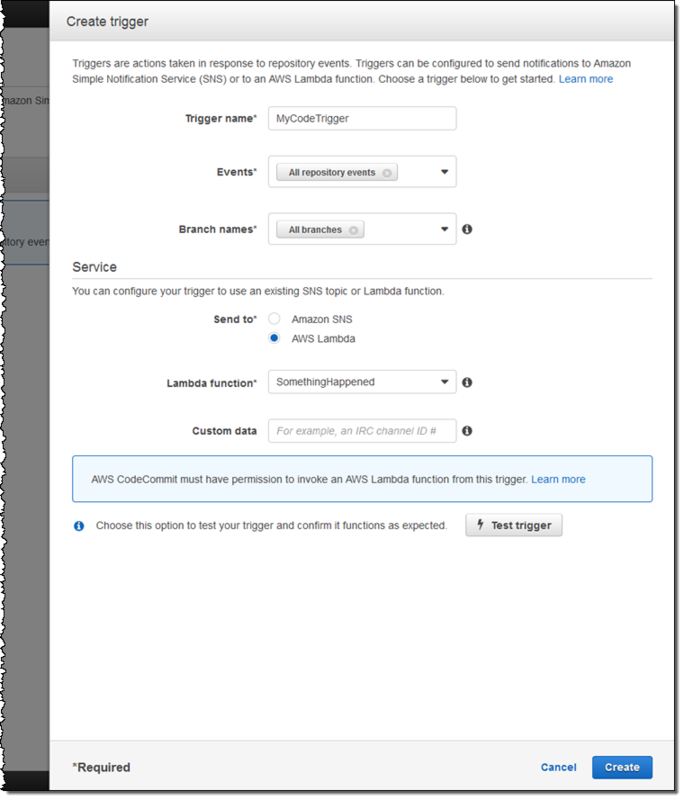 Triggers can send a notification to an Amazon Simple Notification Service (SNS) topic or can invoke a AWS Lambda function. Each trigger can also be augmented with custom data (an uninterpreted string) that you can use to distinguish the trigger from others that run for the same event. You can use triggers to subscribe to repository events through email or SMS. You can wire up SNS to SQS and queue up jobs for your CI/CD tools, or you can use SNS to activate webhooks provided by your tools. In any case, the actions you designate will be triggered by the changes in your CodeCommit repository. You can also use Lambda functions to trigger builds, check syntax, capture code complexity metrics, measure developer producitivity (less is more, of course), and so forth. My colleagues have also come up with some off-unusual ideas that you can find at the end of this post! Then I point to my SNS topic or Lambda function (after ensuring that the proper permissions are in place), use Test Trigger to make sure that it all works as expected, and click on Create. I fixed this by reading How to Allow AWS CodeCommit to run the Function in the documentation! This new functionality is available now and you can start using it today.To learn more, read about Managing Triggers for an AWS CodeCommit Repository. Video Deployment – Have your Lambda function check to see if a new video or a new version of an existing video has been committed, and deploy the video to YouTube. Party Time – Automatically throw and cater a party (using APIs for sandwiches, pizza, and beer) when you deploy a new release. Advertise Releases – When a new release is ready, automatically generate and run a Facebook ad and publicize the release on social media. I am looking forward to hearing about the creative ways that you make use of these triggers within your development process. Leave me a comment and let me know! I would love to see what kinds of cool functions you come up with. Please feel free to post your work as a comment to this post. 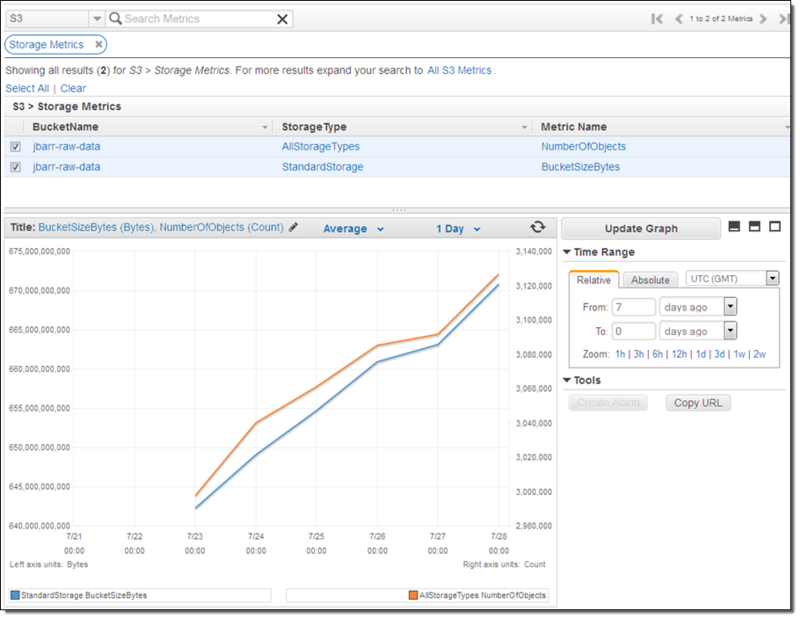 Changes to Amazon Simple Storage Service (S3) buckets – see Handling Amazon S3 Events. 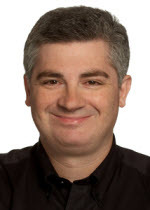 Updates to Amazon DynamoDB tables – see Processing Events from Amazon DynamoDB Streams. Messages arriving in Amazon Kinesis streams – see Processing Events from an Amazon Kinesis Stream. 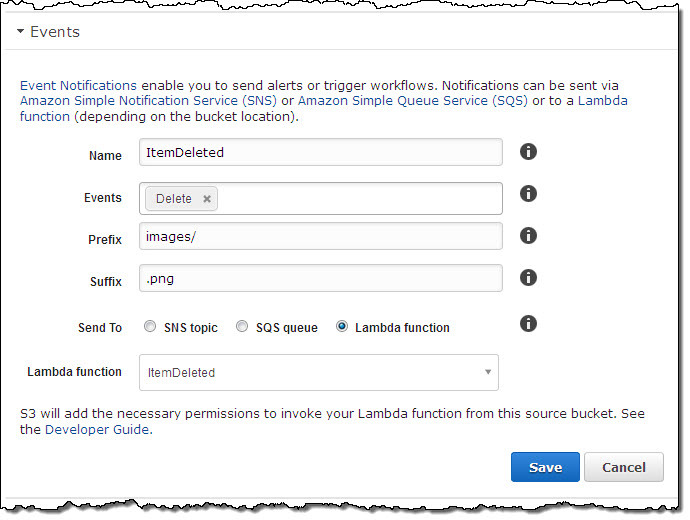 Notification to Amazon Simple Notification Service (SNS) topics – see Invoking Lambda Functions Using Amazon SNS Notifications. HTTP requests (via the Amazon API Gateway) – see Walkthrough: API Gateway and Lambda Functions. 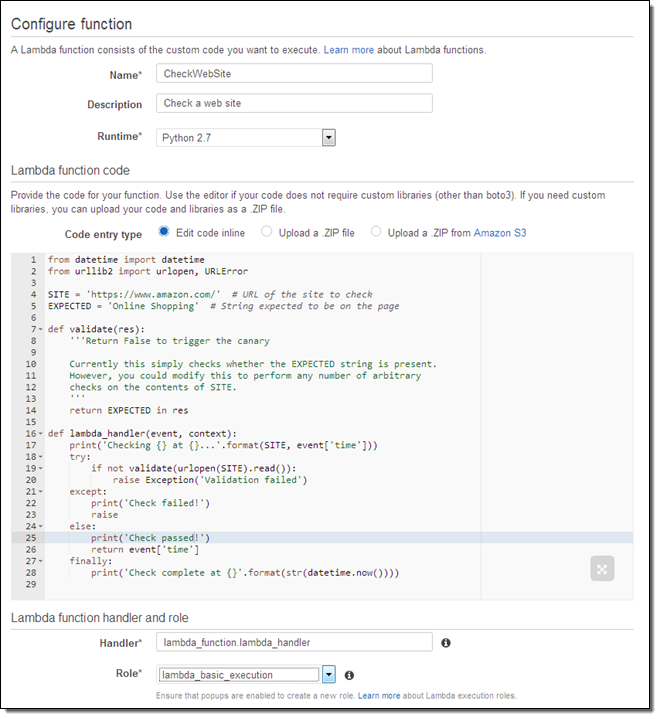 Evaluation of AWS CloudFormation templates – see AWS::Lambda::Function. Firing of Amazon Cognito events – see Amazon Cognito Events. Activation of an Alexa Skill – see Developing an Alexa Skill as a Lambda Function. 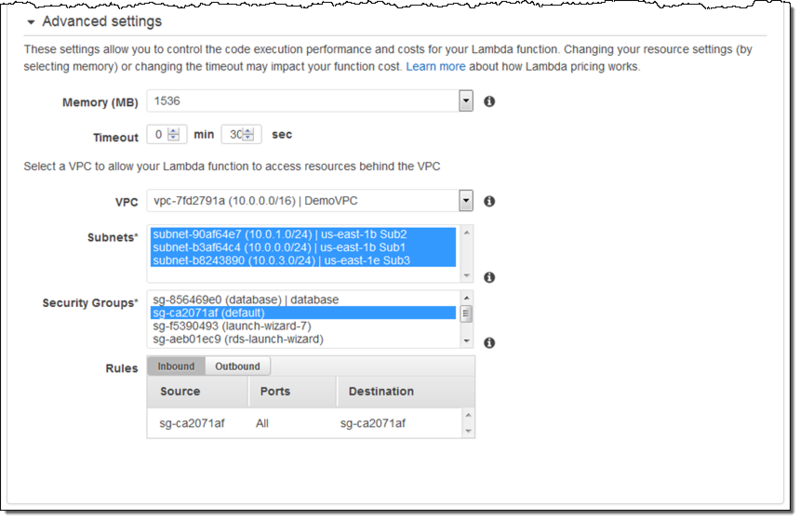 Calls from Amazon Simple Workflow Service (SWF) activities – see AWS Lambda Tasks. Incoming email messages – see Receive and Process Incoming Email with Amazon SES. CloudWatch Logs – see Near Real-time Processing of Amazon CloudWatch Logs with AWS Lambda. Over the past year we have added lots of new features to Lambda. We launched in three AWS regions (US East (Northern Virginia), US West (Oregon), and EU (Ireland)]) and added support for Asia Pacific (Tokyo) earlier this year. Lambda launched with support for functions written in Node.js; we added support for Java functions earlier this year. As you can see from the list above, we also connected Lambda to many other parts of AWS. Over on the AWS Compute Blog, you can find some great examples of how to put Lambda to use in powerful and creative ways, including (my personal favorite), Microservices Without the Servers. As you can see, it is all about the functions! Let’s take a look at each of these new features. Many AWS customers host microservices within a Amazon Virtual Private Cloud and would like to be able to access them from their Lambda functions. Perhaps they run a MongoDB cluster with lookup data, or want to use Amazon ElastiCache as a stateful store for Lambda functions, but don’t want to expose these resources to the Internet. You will soon be able to access resources of this type by setting up one or more security groups within the target VPC, configure them to accept inbound traffic from Lambda, and attach them to the target VPC subnets. Then you will need to specify the VPC, the subnets, and the security groups when your create your Lambda function (you can also add them to an existing function). You’ll also need to give your function permission (via its IAM role) to access a couple of EC2 functions related to Elastic Networking. This feature will be available later this year. I’ll have more info (and a walk-through) when we launch it. Lambda is a great fit for Extract-Transform-Load (ETL) applications. It can easily scale up to ingest and process large volumes of data, without requiring any persistent infrastructure. In order to support this very popular use case, your Lambda functions can now run for up to 5 minutes. As has always been the case, you simply specify the desired timeout when you create the function. Your function can consult the context object to see how much more time it has available. Functions that consume all of their time will be terminated, as has always been the case. When you start to build complex systems with Lambda, you will want to evolve them on a controlled basis. We have added a new versioning feature to simplify this important aspect of development & testing. Each time you upload a fresh copy of the code for a particular function, Lambda will automatically create a new version and assign it a number (1, 2,3, and so forth). The Amazon Resource Name (ARN) for the function now accepts an optional version qualifier at the end (a “:” and then a version number). An ARN without a qualifier always refers to the newest version of the function for ease of use and backward compatibility. A qualified ARN such as “arn:aws:lambda:us-west-2:123456789012:function:PyFunc1:2” refers to a particular version (2, in this case). Each version of a function has its own description and configuration (language / runtime, memory size, timeout, IAM role, and so forth). Each version of a given function generates a unique set of CloudWatch metrics. The CloudWatch Logs for the function will include the function version as part of the stream name. Lambda will store multiple versions for each function. Each Lambda account can store up to 1.5 gigabytes of code and you can delete older versions as needed. You can use ARNs with versions or aliases (which we like to call qualified ARNs) anywhere you’d use an existing non-versioned or non-aliased ARN. In fact, we recommend using them as a best practice. This feature makes it easy to promote code between stages or to rollback to earlier versions if a problem arises. For example, you can point your prod alias to version 3 of the code, and then remap it to point to version 5 (effectively promoting it from test to production) without having to make any changes to the client applications or to the event source that triggers invocation of the function. This feature is available now in the console, with API and CLI support in the works. Last year we announced that the AWS Public IP Address Ranges Were Available in JSON Form. This was a quick, Friday afternoon post that turned out to be incredibly popular! Many AWS users are now polling this file on a regular basis and using it to manage their on-premises firewall rules or to track the growth of the AWS network footprint over time. If you are using AWS Direct Connect, you can use the file to update your route tables to reflect the prefixes that are advertised for Direct Connect public connections. Today we are making it even easier for you to make use of this file. You can now subscribe to an Amazon Simple Notification Service (SNS) topic and receive notifications when the file is updated. Your code can then retrieve the file, parse it, and make any necessary updates to your local environment. In either case, your app will be responsible for fetching the file, parsing the JSON, and extracting the desired information. To learn more about the file, read about AWS IP Address Ranges. If you build something useful (environment updates) and/or cool (an intriguing visualization) that you would like to share with the other readers of this blog, please feel free to leave me a comment! PS – My count shows 13,065,550 IP addresses in the EC2 range as of August 25, 2015.